The Adventures of Tom Bombadil (full title The Adventures of Tom Bombadil and Other Verses from the Red Book) is a collection of poetry written by J. R. R. Tolkien and published in 1962. The book contains 16 poems, two of which feature Tom Bombadil, a character encountered by Frodo Baggins in The Fellowship of the Ring (the first volume in The Lord of the Rings). The rest of the poems are an assortment of bestiary verse and fairy tale rhyme. Three of the poems appear in The Lord of the Rings as well. The book is part of Tolkien's Middle-earth legendarium. The volume includes The Sea-Bell, subtitled Frodos Dreme, which W. H. Auden considered Tolkien's best poem. It is a piece of metrical and rhythmical complexity that recounts a journey to a strange land beyond the sea. Drawing on medieval 'dream vision' poetry and Irish 'immram' poems the piece is markedly melancholic and the final note is one of alienation and disillusion. The book was originally illustrated by Pauline Baynes and later by Roger Garland. The book, like the first edition of The Fellowship of the Ring, is presented as if it is an actual translation from the Red Book of Westmarch, and contains some background information on the world of Middle-earth that is not found elsewhere: e.g. the name of the tower at Dol Amroth and the names of the Seven Rivers of Gondor. There is also some fictional background information of those poems, linking them to Hobbit folklore and literature and to their actual writers (some of them are ascribed to Samwise Gamgee). The book uses the letter "K" instead of "C" for the /k/ sound in Sindarin (one of the languages invented by Tolkien), a spelling variant Tolkien used many times in his writings. 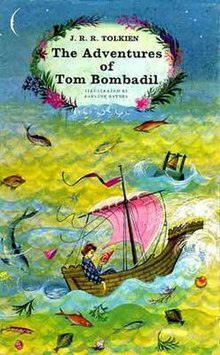 The Adventures of Tom Bombadil was first published as a stand-alone book in 1962. Some editions, such as the Unwin Paperbacks edition (1975) and Poems and Stories, erroneously state that it was first published in '1961'. Tolkien's letters confirm that 1962 is the correct year. Beginning with The Tolkien Reader in 1966, it was included in a number of anthologies of Tolkien's shorter works. This trend continued after his death with Poems and Stories (1980) and Tales from the Perilous Realm (1997). In 2014 Christina Scull and Wayne G. Hammond edited a new stand-alone edition, which includes for each poem detailed commentary, original versions and their sources.